What is the best part of winter? Most definitely not the cold. What, then? Well, winter sports, of course. Skiing, snowboarding, mountain climbing and a whole lot of other sports that can be enjoyed during this season. But in such weather conditions, wearing appropriate clothes is a necessity and sometimes it’s not as easy as it may seem. You don’t want to be cold, but you don’t want to wear too many clothes, either. That’s why jackets were made. Not all jackets are suitable when you’re climbing up a mountain, though, so that’s why sport jackets were made. 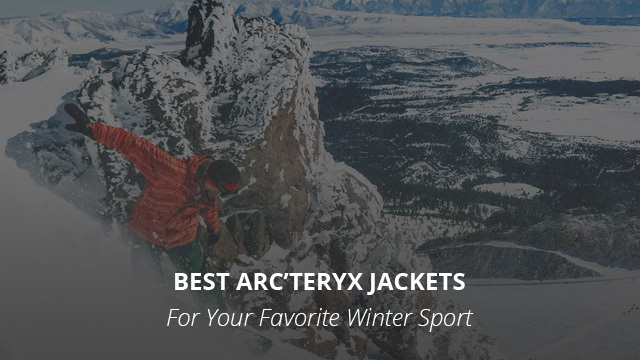 For today’s selection we have chosen 11 jackets by Arc’teryx, the Canadian brand that comes with different sports jackets to suit all sports and all needs, despite the weather conditions. From insulated jackets, to loose fitting ones, Arc’teryx has thought of everything to keep you warm while you wrestle with snow. The first one on this list is the Fortrez jacket. It is designed to be as comfortable as possible and to allow maximum mobility. 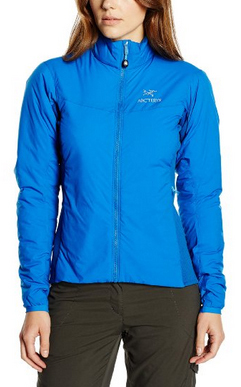 The main feature is the high air permeability which makes this jacket easy to dry and very breathable. There’s a hood that can be fitted around the head, and with chin guards on the collar and also an integrated neck warmer, it ensures that you’ll be as warm as possible, despite the temperatures. The material is elastic and it is lightly insulated as well. It comes in four different colors: Grey, Oxblood, Mantis green and Nighthawk. 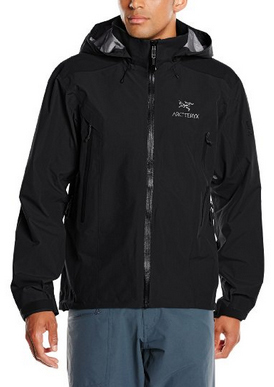 You might also like: Why is Arc’teryx so Expensive? Are their Jackets Worth the Price? 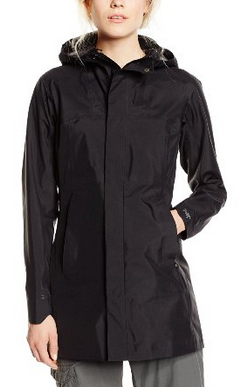 This Gore-Tex Pro jacket is ideal for any kind of sport that runs a risk of getting your clothes wet. It is made of waterproof material and warm inner lining. You can go trekking, skiing, snowboarding and enjoy yourself without worrying about the rain or snow. 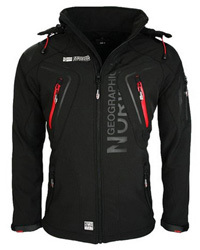 It comes only in black, with an adjustable hood and two side pockets on the middle. It is articulated at the elbows, so mobility will not be a problem. Read also: Ski Jacket vs Winter Jacket: What’s the Difference? If looking like a scuba diver while as far from the sea as possible is your main intention, then here you go. 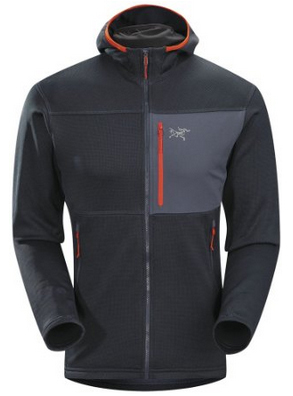 The Arc’teryx Procline Hybrid jacket is suitable for winter as well as any other season. It is wind resistant and made of Tyono™ material, an Arc’teryx trademarked nylon fabric that is bonded to a layer of Polartec® fleece which prevents the jacket from getting damp from moisture. This makes for a very durable combination, against not only weather but also environmental conditions. It comes in dark grey with a combination of orange on the inside lining, and in adriatic blue. With articulated elbows for better movement and durable, waterproof material, can this jacket get any better? Well, since it comes with several additional features like adjustable hood, breathable material and an inner pocket besides the two on the sides, it also offers a wide selection of colors: Poseidon, Oxblood, Echo Blue, Kyanos, Black, Olive and Carbon copy. 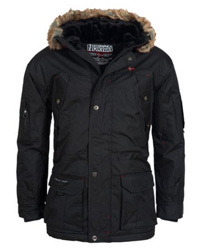 Just like the other jackets of this category, it is suitable for any winter activity. 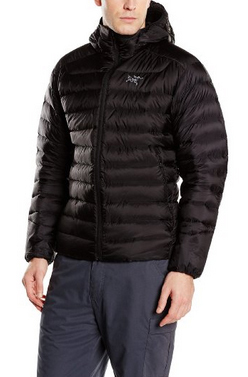 You might also like: Arc’teryx vs Canada Goose – Which Brand is Better? The Cerium LT jacket is a bit bulkier than the rest of them, but it is also very lightweight due to the material it is made of. 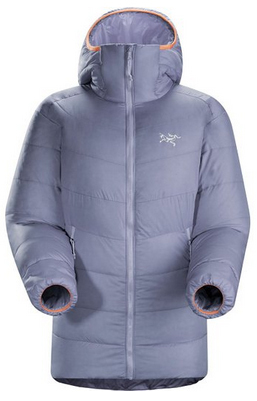 There are two side pockets for the hands, and an adjustable hood that due to the Coreloft material, just like the rest of the jacket, is completely insulating, when adjusted. It is wind and water resistant, with a water repellent feature on the outer material, so even during a storm, it remains dry and warm. There are four colors to choose from: Black, Dark blue, Riptide, Marine. Read also: Ski Jacket vs Snowboard Jacket – What’s the Difference? With Gossamera polyamide material and a filling of Coreloft, the Atom Hoody is not only breathable and water repellent, it is also lightweight, despite being a very cozy and warm jacket. It comes only in a green color, with a dash of black on the inside. It has a long collar and an adjustable hood, so you can drive all day on the snowmobile, without any discomfort from the weather. We start off the women’s jackets with a coat made of GORE-TEX® membrane, giving it an increased durability as well as making it weather-proof. 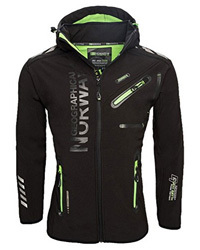 It can be zipped on the front, with snap buttons on the collar, to protect your from cold winds. 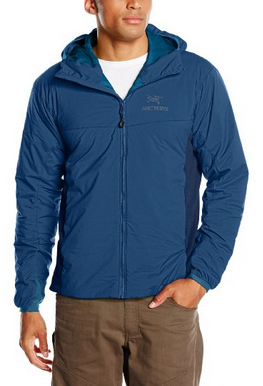 It’s lightweight and comfortable, with two side pockets for hands and a hood. There are two colors to choose from, Black and Green. The Atom LT lightweight jacket for women is ideal as a sports jacket, especially for mild temperatures’ sports, like hiking or trekking. It is made of water repellent material, with elastic side inserts to make it fit better and be comfortable to wear. 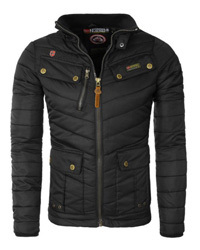 This jacket has articulated elbows as well, with soft collar lining, which will prevent the wind from being a problem. It comes in two colors, Black and Genziana Blue. You might also like: Arc’teryx vs Patagonia – Which Brand is Better? 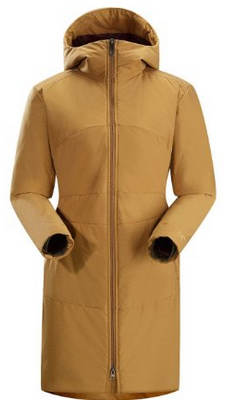 The Darrah coat in honey comb color is a knee-length jacket with long sleeves and an adjustable hood. It comes with a long and soft collar for your neck, and with a zipper going all through the length of the jacket. It is suitable for cold, damp weather, all the while being of a very elegant and feminine design. With articulated elbows and two side pockets, this jacket is perfect for those who prefer a bit of elegance while out in the winter. 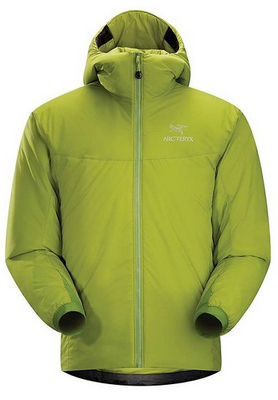 Read also: Arc’teryx vs Marmot – Which Brand is Better? Not quite a jacket, more of an inner clothing, this fleece long shirt, is ideal clothing to wear with any of your jackets. 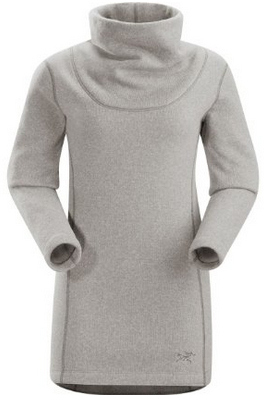 It comes in grey and with a storm collar and dense material, to isolate you from the cold. It is medium length, with articulated elbows and side seams that allows for a proper fit. We’ll end this article with a robust Arc’teryx jacket for women, made with high quality Arato nylon. It is suitable for any outdoor sport during winter time, especially for very cold areas. With a really high collar up to the chin, a properly fitted hood and inner polyamide lining, this jacket can get you through anything. It is zipped up all the way through and there are two side pockets that can be closed with a zipper as well. 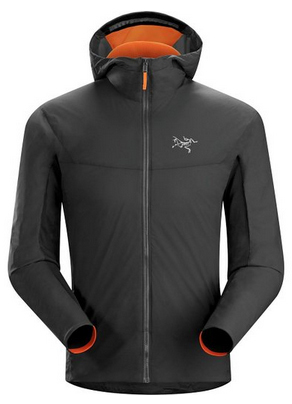 Previous Article← Arc’teryx vs Marmot: Which Brand is Better?